The Xchange Pro Cassette roller banner is a premium cassette banner stand, which features simple change graphics meaning you can easily change your marketing message. All you need to do is insert the removable graphics cartridge into the mechanism and pull up the print media and you are ready to display at an exhibition, conference or retail space. Available in 850mm or 1000mm versions the Imagine also has a hybrid telescopic pole which allows you to change the height of the graphic display for different applications. 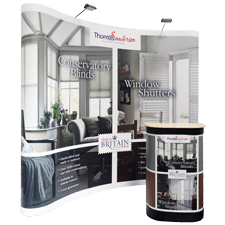 The Xchange Pro Cassette roll up banner is made up of an aluminium base with black end caps to provide stability. Also provided is a hybrid, part bungee part telescopic pole, allowing for a change of graphic height if required. 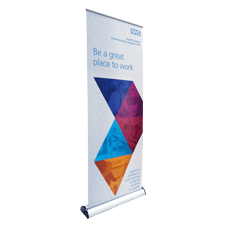 The base and poles are supplied with a lifetime manufacturer’s guarantee making this a reliable an excellent long term display solution. The graphic is printed in-house on one of our top-of-the range printers. The visible graphic size is 2130mm (h) x 850/1000mm (w). The graphics come supplied in a cartridge which is easily slid into the main unit. You can purchase additional cassettes and graphics if you would like to display different designs on the same unit. A padded carry bag is also supplied to give maximum support for the banner in transit. Here's a short video that shows how easy it is to change the graphics cassette on a cassette banner stand.